The Whig Party considered four candidates for the presidential election of eighteen forty-eight: Senator Henry Clay of Kentucky, General Zachary Taylor, General Winfield Scott and Senator Daniel Webster of Massachusetts. Clay was seventy years old. He knew it would be his last chance to get into the White House. He worked hard to get the support of party leaders. But they did not give Clay their support. They wanted to win the election, and they felt they had a better chance for victory with a military hero like General Taylor. Now, with this week's program in our series, here are Doug Johnson and Gwen Outen. Taylor was sixty-three years old. He had almost no formal education. He had spent almost forty years in the West as an Indian fighter and commander of small army posts. A number of politicians did not believe he had the ability to be president. General Taylor's supporters put great energy into their campaign for his nomination. They tried to sell the idea that the old general was the only man who could defeat the candidate of the Democratic Party. On the first vote of the convention, Taylor got the most votes. But no candidate got the necessary majority. On the fourth vote, all of Webster's supporters and many of Clay's supporters gave their votes to Taylor. He finally won the Whig Party's nomination for president. 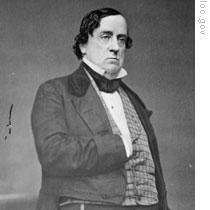 The Democratic Party's candidate for president was Senator Lewis Cass of Michigan. Many Americans did not like either candidate, because of the candidates' policies on slavery. Lewis Cass saw nothing wrong with slavery if that was what the people wanted. Zachary Taylor was a slave owner. In Ohio, a group of men decided to form a new political party. They called it the Free Soil Party, because they believed in free land for free settlers. They wanted no further spread of slavery. The Free Soil leaders proposed a convention of all who supported their ideas. Ten thousand people went to the convention in Buffalo, New York. For two days, the delegates debated the slavery issue and discussed their choice of a candidate for president. They also worked on a platform -- a statement of their party's purpose. The platform declared that slavery was an institution of the states, not the nation. It said Congress had no right to help spread slavery by permitting it in the new western territories. The platform declared that the issue should be faced with firmness. No more slave states. No more slave territory. No more compromises with slavery, anywhere. Convention delegates then voted on candidates. They chose former President Martin Van Buren as candidate for president. The people of the nation voted on November seventh. It was the first time a presidential election was held on the same day in all parts of the country. 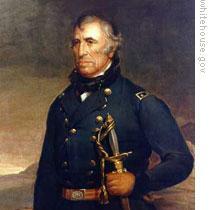 Zachary Taylor won both the popular and electoral votes. He became the twelfth president of the United States. Congress met a few weeks after the election, long before Taylor took office. It faced serious problems. Territorial governments were needed for the areas won in the war against Mexico. California, especially, needed help. Gold had been discovered in California. Thousands were moving there. A government was needed to protect the lives and property of the new population. The dispute over slavery had prevented Congress from acting earlier. Southerners wanted the right to take slaves into the new territories. Northerners wanted to keep slavery out. Then there was the question of laws forcing northern states to return escaped slaves to their owners. The laws were not always obeyed. Southerners wanted a new law that would be easier to enforce. Congress found it difficult to act on these problems. 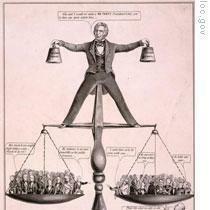 The House of Representatives was controlled by members of the Free Soil Party, which opposed slavery. The Senate was controlled by southerners, who supported slavery. The two houses found it almost impossible to agree on anything. Early in January, eighteen forty-nine, a congressman proposed a bill to first limit, and then end, slavery in the District of Columbia. The bill would free all slaves in the district who were born after a certain time. It would permit the federal government to buy slaves and then free them. Opposition to the bill was strong. It was amended. The new bill would simply close all places in the District of Columbia where slaves were bought and sold. Southern congressmen disliked the bill, even as amended. They organized a committee representing every one of the southern states. Senator John C. Calhoun of South Carolina said the committee should write a declaration explaining the position of the South. The committee agreed, and Calhoun wrote most of the declaration himself. The southern declaration accused the North of many aggressions. The South, it said, faced many dangers. Soon there would be enough free states to control both the House and the Senate. And then the Constitution would be changed and all slaves would be freed. And this, said the southern declaration, would lead to bitter hostility and war between North and South. The declaration called on the people of the South to unite and be firm in their opposition to the North. With this new firmness, southern lawmakers fought to make slavery legal in the new territories. They effectively blocked proposals for territorial governments in California and New Mexico. Congress ended its session on March fourth, eighteen forty-nine, without any progress. Zachary Taylor was sworn-in as president that same day. The new president believed it would be easier to get statehood for California and New Mexico than to create territorial governments for them. Taylor, as we have said, was a slaveholder. But he believed that both California and New Mexico should be free states. During these years around eighteen fifty, the people of the United States were becoming more and more involved in the dispute over slavery. In the North, more people joined the anti-slavery campaign. Even those who did not wish to end slavery in the South felt that slavery should not spread further. In the South, many people felt that the constitutional equality of fifteen southern states was being questioned. Sixteen hundred million dollars worth of slave property was threatened by Abolitionists. Southerners felt that if the campaign against slavery was successful, everything they believed in would be destroyed. People hoped that President Taylor would be able to bring the North and South together again. But his message to Congress showed no signs of such leadership. Taylor asked Congress to give statehood to California immediately. He reported that California leaders had written a state constitution. The constitution banned slavery. Settlers from both the North and South supported the document. The president also reported that the people of New Mexico would be asking for statehood soon. He said it would be best to let the people themselves decide if New Mexico would be a slave or free state. Taylor's opponents described these proposals as his "no action plan." President Taylor really had no policy. He could not support a bill to keep slavery out of the territories. That might start a quick revolt among the southern states. He could not support a bill to let slavery spread into the territories. That would make the North rise in anger. Taylor tried to be neutral. He hoped the problem of slavery would solve itself. But the problem would not solve itself. The division between North and South grew wider. That will be our story next week. Our program was written by Frank Beardsley. The narrators were Doug Johnson and Gwen Outen. Transcripts, MP3s and podcasts of our programs, along with historical images, are at www.unsv.com. Join us again next week for THE MAKING OF A NATION -- an American history series in VOA Special English. yes, in this section i have learned that the Gold Rush had happened in California around in 1840es.and the issue of the slavery is more and more serious. so the Civil War would broke out before long. balance is difficult .usa how to load?